Notre Dame’s offensive line shined in moments in 2018, but the Irish knew there was much work to be done as they left the field following the loss to Clemson. Left tackle Liam Eichenberg has been one of the offensive lineman leading the charge to improve in 2019 after starting for the first time a year ago. Consistency along the line from a personnel standpoint has also helped Eichenberg’s growth this spring. Left guard Aaron Banks has become a steady force with Josh Lugg also working in at the position. The Ohio native has always been honest with his assessment of his own game dating back to his recruitment. Eichenberg knows where he needs to improve as an individual and has made sure to focus on it this spring. 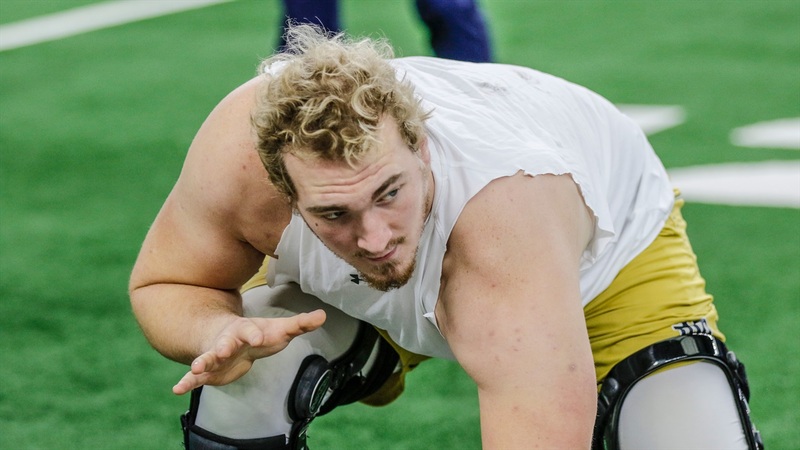 “The biggest thing I need to improve on is bending my left leg in pass pro,” stated Eichenberg. “I need to be conscious of it and keep my left leg strong. I see it on film and I’m trying to work it in drills. It’s slowly getting there. As a whole, the offensive line has focused on its weaknesses from a year ago and the changes have been positive. “Banks has improved his footwork a tremendous amount,” said Eichenberg. “He’s not tentative or hesitating. He’s attacking it and driving his left leg through and gaining ground. It makes my job easier. Jarrett Patterson is doing a fantastic job stepping in there. He’s a great ball player and seeing everything we’re seeing. Notre Dame will need Patterson to step up in a significant way as losing Sam Mustipher won’t be easy to replace as he was the heart and soul of the Irish offensive line.